A lot of people ask what they should do in Los Angeles, but they forget that they also need to know what not to do. The city has more than enough beaches, restaurants, museums, shopping and nightlife to fill several vacations. But if you have limited time in the city, there are a few activities that just don't make the cut. But those aren't the only things you shouldn't do when you visit Los Angeles. In fact, there are some other things that you may want to avoid to keep from looking like a dumb tourist or getting stopped by a cop. Keep reading to get the lowdown on what they are. Lots of people have the mistaken idea that movie stars are roaming around all over Los Angeles, and you might meet one at any moment while buying aspirin at the drug store or taking the dog for a walk. In all the years that I lived there and all the times I've visited, I can count about three times that I actually saw someone that way. You could easily spend your entire vacation trying to see someone famous — and failing. Most of the movie star home tours originate on Hollywood Boulevard, and they sound exciting. But the truth is far less glamorous. Don't expect to take a one-hour bus tour and go home bragging about spotting a Kardashian. Do you still want to go on a tour? Consider the Beverly Hills Trolley Tour, which dishes up plenty of Hollywood gossip and respects stars' homes. Or try the Dearly Departed Tour, a tour that gets its facts right. Most celebrities today live away from Hollywood—in Malibu or Orange County—so these tours and maps show homes that stars used to live in. Which is not very exciting. Instead of hanging around somewhere that someone who might be famous may or may not have been seen last month, try these places where a celebrity sighting is guaranteed. Hollywood Boulevard is stocked with your typical kitschy tourist-trap hangouts likeThe Guinness World Records Museum and Ripley's Believe it or Not. It even has not one but two wax museums within a couple of blocks. If you're into that kind of thing, Madame Tussaud's is the best choice of the bunch. The LA branch of the famed wax museum houses Marvel superhero figures, a Madonna replica, and an Obama statue. Explore some of Hollywood's most interesting spots by taking this one-day self-guided tour. Abandon any dreams of posing right next to the Hollywood sign. No matter where you drive or hike, you can't get up close and personal with the iconic sign; it's fenced off and protected by an elaborate security system—and an arrest is guaranteed if you try to bypass security. To make matters worse, too many camera-toting, GPS-enable tourists flock into the surrounding neighborhoods trying to get close to it that those residential lanes start to look like the 405 at rush hour. The best thing to do is just grab a photo when you see the sign. Use this guide to find all the best views of the Hollywood Sign. LA's Chinatown is small. It looks more like a Hollywood film set than San Francisco's lived-in Chinatown. Maybe that's partly why so many things have been filmed in it, including Rush Hour, Lethal Weapon 4, and Chinatown. It doubled as Hong Kong on an episode of NCIS. There's even a seven-foot-tall bronze statue of Bruce Lee in the middle of it. That said, the neon lights are Instagram-worthy, and it can be fun at night if there's a festival going on. But you can also skip it, and you won't miss much. Sunset Strip is also on the list of things to do in LA because people want to see it and it can be a fun place to visit. Just not right now. The Sunset Strip's legendary appeal stems from the nightclubs along it. During the day, there's less to see, and it feels like a dozen other shopping and dining strips in LA. Some people say you should go at night and dedicate time to the strip's iconic restaurants and clubs like The Troubador and The Roxy, but many of those are losing their appeal. And to make matters worse, Sunset Boulevard has been under massive construction in the past few years. With another big project coming up, that will only get worse. Until all of that settles down, you might just want to skip that area altogether and try some of these things to do in LA at night instead. Angelenos may live close to Mexico and a lot of them speak Spanish, but when it comes to pronunciation, they sound like a bunch of Midwesterners. San Pedro, that city near the port of Los Angeles isn't San PAY droh. It's San PEE droh. When you're talking about the Los Feliz neighborhood near Silver Lake, don't say Loss Fuh-leez. In LA, it's Los FEE liss. The gorgeous peninsula with all those multi-million dollar mansions on it is Palos Verdes. Tha would be pronounced PAL uhs VER dees. Odd pronunciation isn't restricted to Spanish words. Rodeo Drive doesn't sound like a cowboy sporting event, either. Instead, you can release your inner pretentiousness with confidence when you say row DAY oh. Willshire Boulevard runs from downtown to Santa Monica. All 15.83 miles of it are pronounced WILL sher. Don't say any highway number without the word "the" in front of it. According to local public television station KCET, this one is a sticky remnant from the days when highways had names. However, it came about, if you don't say "The 5" when referring to the Interstate highway, you'd might as well wear a button that says "Clueless Tourist." Don't say Do you know the way to San Jose? Anyone who's old enough to remember the song might snicker, but many people will just stare at you blankly or tell you get out your Google Maps and find out for yourself. Don't ask a local to go to The Grove, Hollywood at Highland, Santa Monica's Third Street Promenade, Runyon Canyon or Venice Beach on the weekend. If there's anything people who live in LA hate, it's "touristy" places — and all of those qualify. Don't ask any local about that hip-sounding place that you just read about on BuzzFeed, either. A few of them may be into the latest and trendiest, but a lot more will probably snort and tell you that it's just a bunch of hipster hype, anyway. Instead, ask someone what their favorite place is that's similar. If you need a ride, don't sound like a clueless New Yorker and say "let's hail a cab." In the first place, you'll be standing there until your hair turns gray waiting for one to pass that you can hail. And these days, everyone takes an Uber instead. Wow! Those pictures of surfers in Venice Beach and Huntington Beach (which is actually in Orange County) look cool, don't they? You may have also heard about the excellent surfing at Lunada Bay in Palos Verdes or Malibu's Surfrider Beach. They're great places to watch surfers, but if you're new in town — or even worse, a beginner surfer — you shouldn't try to surf them. Local surfers can get territorial at these places and in some of them, rock throwing or someone shouting "Get the [f-word] out of here!" are some of the more welcoming receptions you can expect to receive. Try Malibu Beach, San Onofre Beach in San Clemente (also in Orange County), or find someone who gives surfing lessons to take you out. I'm not sure exactly what happens when you live in a place where nighttime temperatures seldom make it into the low 30s, but somehow you lose your tolerance for cold. A friend who was born and raised in Los Angeles actually texted me this: "Cold here today..." It was 8:00 a.m. and the temperature was 63 degrees. I told him that only a native Californian would say such a thing, but I don't doubt that he felt cold. When you see a Californian wearing a zipped-up hoodie, scarf, and gloves when the thermometer says 60-something, please don't laugh. In return, we'll try not to giggle when you go out in the same weather wearing nothing but shorts, a sleeveless t-shirt, and flip-flops. Don't go to Rodeo Drive to go shopping. That is unless you intend to spend like a spoiled Princess. Some people say don't go to Rodeo Drive at all, but I disagree. If you think of it as a tourist attraction, it's a fun place to see. Don't go to The Grove to buy things, either. It's too crowded, and you have most of those same stores near you back home. That doesn't make it a place to avoid altogether, especially because you also go to the Farmers Market while you're there. Hollywood at Highland is more fun for touristy gawking than it is for purchasing, too. Don't go looking for outlet malls in LA, either. There aren't many, and they're all way out of town. Go shopping for designer fashions on Melrose Avenue. Shop the manufacturer's stores in the downtown Fashion District. Brave the crowds to shop at the local boutiques on Abbot Kinney Boulevard in Venice Beach. Or try some of the places on this shopping map from Racked. 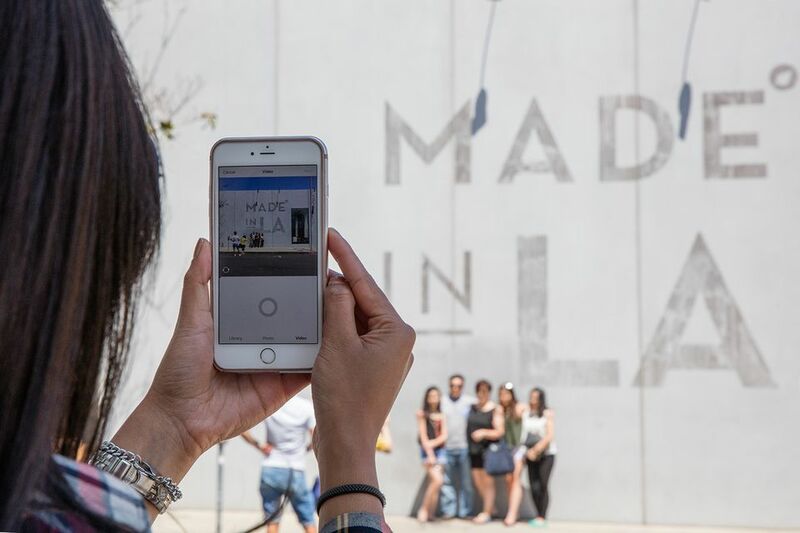 You've seen those lists of best places to take Instagram photos in Los Angeles. Haven't we all? In fact, most of them are so over-hyped that you'll end up standing in line just to get that shot in front of a pink wall, a pair of angel wings or some glorified graffiti art. I'm guilty of that myself, but it was in the name of research. We stood in line behind a half dozen other people just to get the shot you see here. Pink Wall at Paul Smith: Just walk around the corner, where you can stand in front of the pink wall on the sidewalk without having to deal with the overzealous bouncer or the hordes of people. Or just go down the street and pose in front of a teal, blue or gray wall. Angel Wings: The wings above off Melrose Avenue are only one of several similar murals by artist Collette Miller. You can find locations of the others in this article by Detour LA. Retna Mural: The silver mural across the street from those angel wings — the one that looks like some kind of odd hieroglyphics — has a stunt double ​at The Lyric Theatre which is at 520 N La Brea Ave. Bleeding Hearts: If you love those drippy, bleeding hearts murals, there's one just outside Alfred Coffee in Silver Lake at 3337 1/2 Sunset Boulevard. And they make a great cup of cold-brewed coffee, too. It doesn't matter what people do where you live. And the fact that New Yorkers routinely ignore traffic lights won't help you escape a ticket. In fact, Los Angeles has very strict laws against jaywalking. According to the City of Los Angeles, that means crossing the street in the middle of a block. You can also get ticketed for starting to walk across a street when the Don't Walk sign is flashing. Or even stepping off the curb too soon. Jaywalking fines can be as high as $250 — which is four times what you'd pay if you parked illegally. Keep in mind that the Los Angeles metro area isn't just one city, it's hundreds of them and every one of them has a different law. Some of them are less strict, but unless you live in LA, you probably don't want to learn them all. If you're visiting from out of town, you can save yourself a lot of annoyance by sticking to the strictest rules. After all, are those few seconds you're going to save worth the hassle? If you don't listen to all this advice and get a ticket, here's a guide to what to do next. If these are the things you shouldn't do in LA, then what should you do? If you're a contrarian traveler who seeks out the undiscovered spots, then don't miss these less-touristy things to do when you go to Los Angeles. If you're traveling with kids, you'll want to check out the Best Places to Take Kids in LA. If your budget is limited (which applies to most of us), you can have a lot of fun without spending a penny. Just use the Guide to Things to Do for Free in Los Angeles. Even though Los Angeles weather is mostly sunny, it might rain in the winter. Here's what to if those raindrops start falling on your head. And if it's summertime when you visit, you'll definitely want to know What to Do on a Summer Night in Los Angeles. And what to do after dark, any time of year. If you want to find out what the most popular tourist attractions are, you can find them (with their pros and cons) in the Top Things to Do in LA.